In the wake of the iOS 6 release Wednesday of this week, and the iPhone 5 release today, it's very clear that this is the biggest and most anticipated release from Apple that has happened since the original iPhone. Techcrunch confirmed that over 15% of users updated to using iOS6 within the first 24 hours. 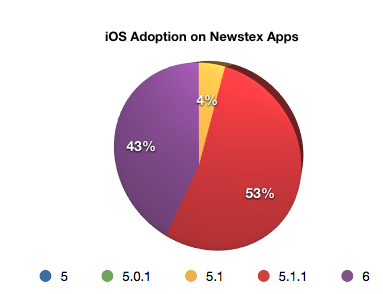 At Newstex, our adoption rates are even higher; we already have 43% of our active users running iOS 6. App developers have been pushing ever since Apple announced the iOS 6 release date to update their apps to support both the iPhone 5 (which simply has a taller screen) and the new OS. While there are only a few changes that you need to do to make your application compatible with these new releases, not making those updates severely limits your total pool of possible users. It's estimated that apple will sell as many as 10 million iPhone 5 devices before the end of the month. If your application still looks letterboxed within this new, taller iPhone, will users really continue to use your app?